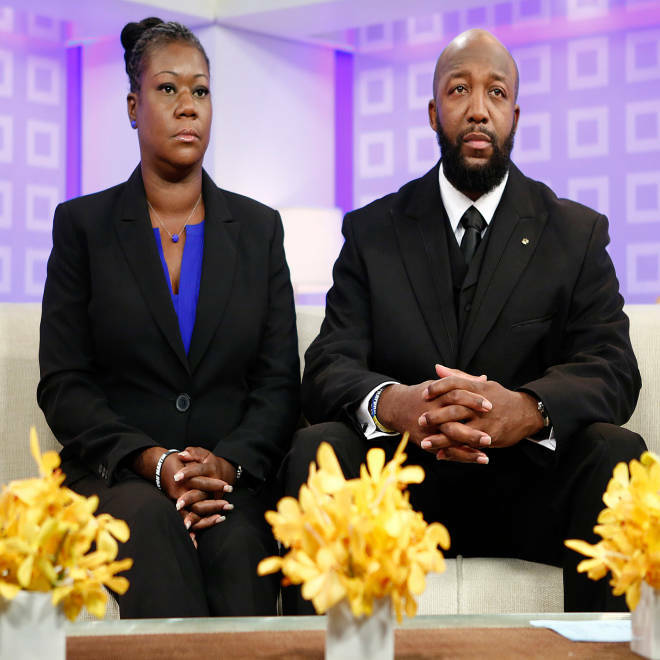 Sybrina Fulton and Tracy Martin, parents of Trayvon Martin, appear on TODAY on July 18. They will participate in a 100-vigil national "Justice for Trayvon" day on Saturday. Civil rights advocates — including Trayvon Martin's parents and brother — will attend vigils Saturday calling on the Justice Department to ramp up its investigation into the George Zimmerman case. The gatherings at federal courts and government centers in about 100 cities from New York to Los Angeles were organized by the Rev. Al Sharpton, head of the National Action Network and host of an MSNBC show, after Zimmerman's acquittal on state charges last weekend. Zimmerman was found not guilty of second-degree murder by a Florida jury on Saturday night. The Justice Department says it has an "open investigation" into the Feb. 26, 2012, shooting, but Sharpton has called for a more "aggressive" probe into whether Zimmerman violated Martin's civil rights. It could be months before the Justice Department makes a decision, but the verdict has already generated strong reaction from Washington. Attorney General Eric Holder called Martin's death "unnecessary" and criticized "Stand Your Ground" self-defense laws like the Florida statute that played a role in the Zimmerman case. On Friday, in his first extended remarks since the verdict, President Barack Obama said from the White House, "Trayvon Martin could have been me 35 years ago." Martin's parents thanked Obama in a statement on Friday for speaking publicly about their son. "We know that the death of our son Trayvon, the trial and the not guilty verdict have been deeply painful and difficult for many people," they said. "We know our family has become a conduit for people to talk about race in America and to try and talk about the difficult issues that we need to bring into the light in order to become a better people." On Saturday, Martin's mom and brother, Sybrina Fulton and Jahvaris Fulton, will stand with Sharpton at a New York vigil, which begins at noon, according to the National Action Network's website. Martin's father, Tracy Martin, will be at the Miami vigil, which starts at 10 a.m. The "Justice for Trayvon" vigils — which include cities as small as Natchez, Miss., with a population just over 15,000 — will be attended by hundreds of preachers. Martin, 17, who was black, was shot dead by Zimmerman, 29, a neighborhood watch volunteer who is of white and Hispanic descent. Zimmerman told police the unarmed teen attacked him in a gated community in Sanford, Fla., and that he shot him in self-defense. Prosecutors did not highlight race during the trial. The one juror from the six-woman panel to speak out since Saturday night's acquittal said she did not think race was an issue in the shooting. After the verdict, defense lawyer Mark O'Mara said that race hadn't played a role in his client's actions the night of his encounter with Martin, and said Zimmerman had been made a "scapegoat" by civil rights advocates. “I think that things would have been different if George Zimmerman was black, for this reason: He never would have been charged with a crime,” he said. In Los Angeles, protesters marched on Interstate 10 on Sunday, closing the freeway for nearly an hour, NBC Los Angeles reported. Local churches across the U.S. also organized rallies and urged supporters to wear hoodies in honor of Martin, who was wearing a black hooded sweatshirt when Zimmerman shot him in the chest. In Sanford, Fla., many held signs calling for an end to Florida’s “Stand Your Ground” law, which allows people to use deadly force if they believe their lives are at risk or they are in imminent danger of serious bodily injury. In his remarks Tuesday, Holder took aim at those laws. "It's time to question laws that senselessly expand the concept of self-defense and sow dangerous conflict in our neighborhoods," he said in a speech to the NAACP, adding such laws may encourage violence. Obama also called for a review of Stand Your Ground laws in his remarks from the White House on Friday. "If Trayvon Martin was of age and was armed, could he have stood his ground on that sidewalk?" Obama asked. "If the answer to that question is at least ambiguous, then it seems to me that we should examine those laws." Groups of protesters also gathered last weekend in Atlanta, Miami, Milwaukee, Philadelphia and Washington, D.C., according to The Associated Press. NBC's Alastair Jamieson, Andrew Rafferty and Tracy Connor contributed to this report.